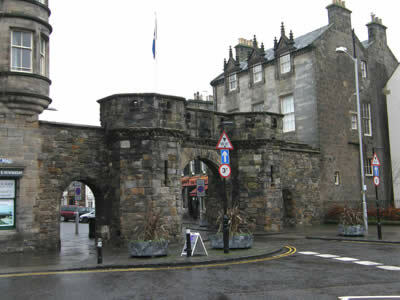 West Port is a 16th century stone town gateway and is one of the few surviving town gates in Scotland. In a building contract drawn up on the 18th May 1589, the gate was to be a copy of Edinburgh's Netherbow Port but in 1843 the port was completely renovated, with some structural alterations. The large vehicular entrance is flanked by two semi-octagonal gun-looped turrets and the two side walls have been pierced with later pedestrian arches. A modern carved panel now replaces the weathered coats of arms, specified in the original contract. There is no evidence to show that St Andrews was ever a walled town, only the street boundaries were closed by ports or gates. At the eastern end of South Street is The Pends. West Port is located in St Andrews, off South Street. 13 miles south-east of Dundee, on the A92-A91.